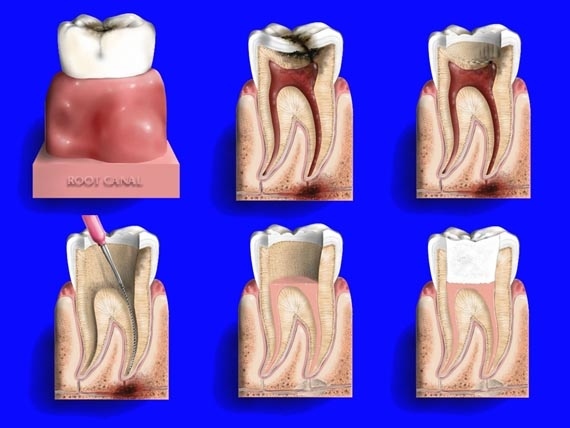 Endodontics, more commonly known as root canal therapy, focuses on the nerves of the teeth. If the nerve of a tooth becomes infected, the tooth may still be saved. The infected nerve needs to be removed from the interior of the tooth. If left untreated, an infection can turn into an abscess, which can lead to more serious problems such as bone loss, swelling and great discomfort. Successful root canal therapy can prevent premature tooth loss. Root canal therapy begins by administering a local anesthetic to the affected area to ensure the patient’s comfort. Once the area is completely numb, Dr. Rowe will place a latex membrane known as a rubber dam around the affected tooth. This rubber dam does two important things. First, it acts as a barrier to keep the patient’s saliva from entering the prepared tooth. Second, it keeps canal irrigation liquids and root canal instruments from entering the patient’s mouth. These two steps ensure patient safety and allow Dr. Rowe to carefully and easily access the tooth and perform high-quality endodontic therapy. He also has a specially designed dental operating microscope, which can be used to improve visibility even more during the procedure. Dr. Rowe will take every possible step to perform root canal therapy with safety and expertise. That’s why he only uses bio-compatible materials to fill the canal system of the treated tooth. Bio-compatible materials are important to use during root canal therapy because the body treats them much like it would any other natural part of the body. This results in a comfortable recovery process for the patient. During the procedure, he will first take several small X-rays of the affected tooth. After the canal has been sufficiently cleaned, it will be filled with suitable bio-compatible sealers and materials. The sealer used is a bio-ceramic, which encourages healthy regeneration of the bone around the infected tooth. After treatment is completed, the opening is sealed with a suitable material. Most often, posterior teeth (molars and bicuspids) will need full coverage such as crowns or onlays following root canal treatment. This will prevent the tooth from splitting, which would require a tooth extraction. Before your procedure, Dr. Rowe will go over everything you need to know. Thanks to recent advances in medicine, root canal therapy has become one of the most effective dental procedures available today with an extremely high success rate. With root canal therapy, you can keep your teeth for a lifetime of smiles and service. Samuel V. Rowe, DMD has over 30 years of experience performing root canal therapy and all other aspects of general dentistry. Our office is located in downtown Ft. Pierce and serves patients in the Port St. Lucie, Vero Beach, Jensen Beach, Stuart and Okeechobee. Contact our office to schedule your appointment with Dr. Rowe.